A good hill for a lazy day. 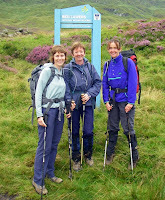 Although the sign says Ben Lawers, we assured the girls that it was the Meall nan Tarmachan path we were following! We had parked in the usual spot, off the narrow Lochan na Lairige road between Loch Tay and Glen Lyon, just south of the dam. We followed a good track for a short distance and then turned north up the ridge that leads to the south-east top at 923m. It's a well worn path. 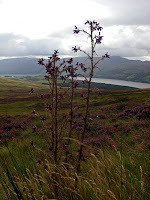 Taking a picture of Spear Thistles (Cirsium vulgare), gave an excuse for a breather! Although the day was bright, it was breezy, and we could see that the summit ridge was shrouded with mist. Ron took off like a man possessed; he had found a glove on the path and decided to chase the couple ahead to reunite the errant mitt with its owners. Alas his effort was wasted, as they denied it was theirs! Ungrateful Baggers! 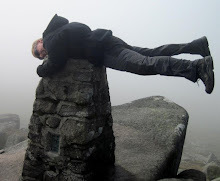 It wasn’t just misty on the ridge; it was very, very wet, both underfoot and from above. Ron wisely decided to turn back. Our wee group descended into the dip before the final pull for the summit of Meall nan Tarmachan. 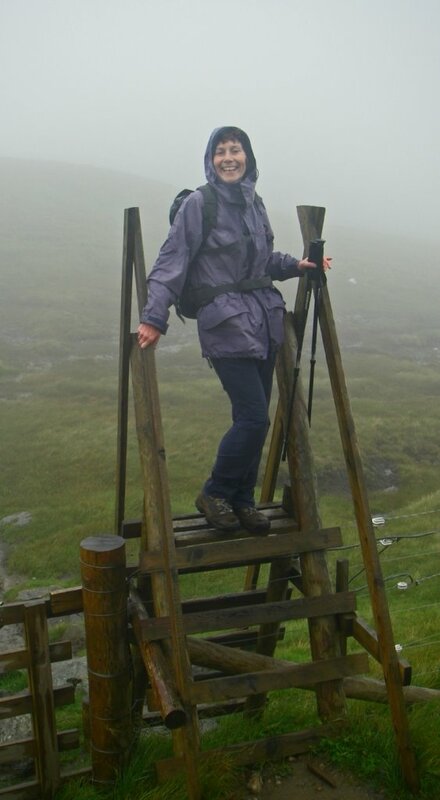 We came across a ladder stile and Dee posed for a picture; she almost seems to be enjoying the downpour! This stile has a 'shocking' suprise for the unwary walker dangling Leki's! 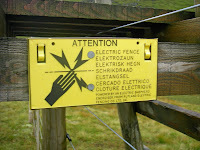 An electric fence across the open hill? It was a dismal trudge to the summit. 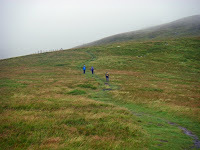 Traversing the Tarmachan Ridge was not appealing; but a few groups of people did head west into the gloom.